Winter wonderland walking in settings like this makes the winter months MUCH more enjoyable, don't you think? Enjoy the stunning beauty of a crisp, fresh winter day ... a beauty that at times is enough to make you tear up, it's just so grand! Also, it seems we're getting more of this winter 'white stuff' in many more places around the world so why not figure out a way to really enjoy it? In fact, in Canada many folks get really excited when the first snowflakes hit the ground. Why not add this 'walking style' to your bag of walking tricks too? No need to stay housebound this winter. Get outdoors and enjoy the fresh, crisp air. 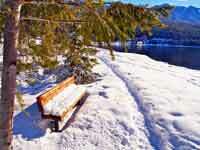 Feel the crunch of the snow under your feet, the cleanliness and beauty, the sunshine on your face. It's quite exhilarating! And yes, experience the sheer joy of continuing your fitness walking program outdoors in the winter. Beauty, fresh air and happiness. Just a super bonus! CAUTION: if you're just starting out with the Level 1 Fitness Walking Program please work your way up to at least Week 4 before venturing out. If you absolutely cannot wait, then we recommend you take these precautions. Make sure you walk with a partner for safety. 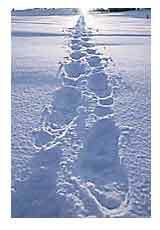 Try and walk only on well cleared or well compacted walking paths or sidewalks until you have your 'winter legs'. IMPORTANT NOTE #1! Walking on rough, unstable snow and ice surfaces does require a good degree of foot and leg muscle flexibility. You need to be able to maintain your balance and react quickly to poor footing. Admit it. We don't jump around those snow banks as nimbly as when we were teenagers! IMPORTANT NOTE #2 Make sure to bring adequate drinking water with you on your walks. You do not want to get dehydrated! OK - on to the nitty gritty! ... are probably THE most important part of enjoying your winter wonderland walking so let's spend some time on this. Winter wonderland walking calls for you to wear shoes that work well in the winter! Yes - winter walking shoes! Sort of like winter tires for your feet! You want shoes that are actually designed for exercise walking, have waterproof lowers & uppers and an outer sole that is rubber-based, not PU based (polyurethane). Rubber soles with a good grip pattern are much safer in the winter. Some insulation may be desirable. It's your call. We use regular (no extra insulation) hiking shoes to about -15°C (-5°F). We prefer a good light hiking boot ourselves with a mid to high top. A good trail running shoe is also good. 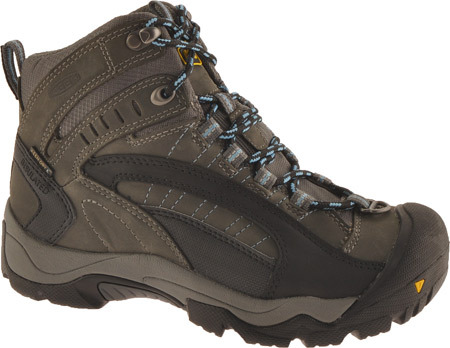 The Keen Revel Hiking Boots (shown) are just such a boot. These particular boots actually have a dual function rubber sole. And we're strong believers in wearing high quality socks. In winter our personal favorite socks are the Thorlo Hiking Socks that have a little more thickness, warmth and comfort. (You can choose the Unisex Thick Cushion Version on this page). We love our Thorlos Socks! Have a look at our Thorlos Socks page for much more information on this essential but often ignored item. Your feet deserve the best! Good foot traction devices like these made it possible for us to really enjoy walking safely and with confidence in our winter wonderland. Add these foot traction devices to your shoes and you can walk safely on ice and snow. Our personal choice is called the Yaktrax Foot Traction Device. They just slip on over your shoes. You want the ones made of natural rubber called the Yaktrax Pro, not the man-made stuff (their lower cost model). They lasted a lot longer for us. Yaktrax has a stainless steel coil wrapped around the rubber. It's these hardened steel coils that bite into the ice and snow. It's amazing how good you feel when you can walk safely with confidence in the winter. We've actually seen joggers using these in the winter too! CAUTION! Take them OFF indoors. On smooth surfaces you can slip, fall and injure yourself very easily. You will most likely damage yourself and the floor. Very dangerous on concrete, tile and stone. They will cause damage to carpets. Only takes a couple of seconds to slip them off. Outdoors only please. It's always a good idea to dress in layers when walking in your winter wonderland. Start with a layer next to your skin that wicks perspiration away. Next, one or two layers, mostly for additional warmth. Third, finish with a wind and weatherproof outer layer with controllable ventilation (for when you get too warm!). 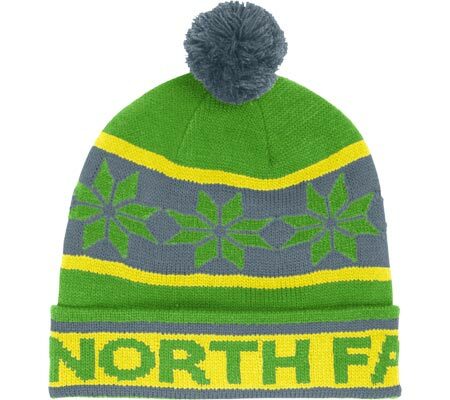 Reputable brands here are Patagonia and The North Face. Good gloves are really important too. Our circulation isn't always what it used to be. Keeping our finger tips warm is always a good thing! 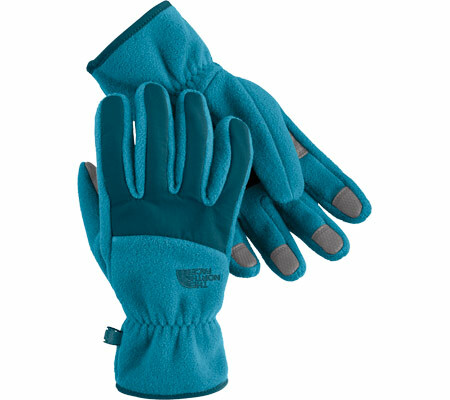 We suggest good winter gloves made specifically for winter activities. They've done some pretty amazing things with winter sport gloves these days. Again we suggest good quality reputable brands like Patagonia and The North Face gear. And if you want to be the darling of your social media scene when you're out walking with your friends, here are glove from Zensah that make it easy for you to use your iPhone, iPod or iPad without taking your gloves off! For your head we suggest Toques or Winter Skull Caps. Something breathable and warm. A dense-knit wool covering usually gives the best performance. You might also consider something called a neck gaiter which is a fancy way of saying 'turtleneck' without the sweater! This is an alternative to a scarf. Remember to wear your sunglasses! Eye protection is very important! It can get extremely bright with all that snow on a sunny day. One thing that works for us is getting our (prescription) sunglasses with oversized lenses to keep out as much sun as possible. Nordic pole walking is a great exercise all year round! All you need are a good pair of nordic walking poles. Winter is NO reason to slow down! Have a look at our Nordic Pole Walking page to learn much more about it. A great way to add more pleasure and health benefit to your winter wonderland walk. The better nordic walking poles have removable rubber tips. Just slip them off to expose carbon tips that work great on loose, snowy or icy suffices. We personally use the LEKI brand of nordic poles and love them! There you have it! Add a liberal dose of a great positive attitude. You'll be rewarded with some of the most enjoyable activity you can find. Great beauty, great exercise, fresh, crisp air and feeling great!